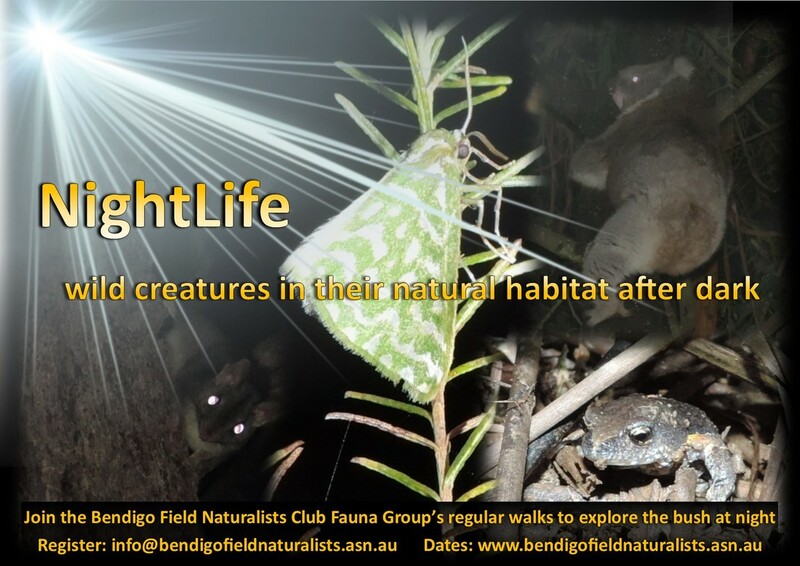 The Bendigo Field Naturalists Club Inc. (BFNC) is a voluntary, not for profit, incorporated association. The purpose of the group is to encourage the study, conservation, and enjoyment of nature. General Meetings: are held on the second Wednesday of each month (February to December) at the ﻿﻿﻿﻿G﻿olden Square ﻿ H﻿all (9 Old Hi﻿gh Street)﻿﻿.﻿ Meetings begin at 7:30 pm, visitors are welcome to attend. This is a fundraising event for the critically endangered Orange-bellied Parrot. All funds raised go to support OBP conservation efforts. Tickets $15.00 (children free). Numbers limited so register now to secure a seat. A special 'meet the film-maker' session and nature photography discussion available prior to the screening ($20.00). Register via contact page. Further details below. specifically designed to develop participants' proficiency across a broad range of field based naturalist skills and knowledge. Visitors are welcome to attend (via RSVP). Workshop 33 will be held in November 2018. This workshop will be an opportunity for participants to learn about identifying and locating the Autumn-Winter flowering terrestrial orchids of the Bendigo region. These species are becoming increasingly sporadic and difficult to find locally as the climate changes, with a delayed break and declining average rainfall. Come along and share your experiences observing these beautiful and intriguing plants. To join us please ﻿contact the BFNC﻿ for further information. Excursions: are held most months throughout the year as advertised. They are usually 4-8 hours and may have a specific interest focus. They are generally to local areas but may also be to areas further away. Visitors are welcome to attend. Watch this space! Walks in the local bush at night to see wild creatures in their natural habitat after dark. Explore, discover, observe, record and exchange - this will be the theme for this series of walks. Join the fauna group's regular walks and experience the wonders of the bush at night. Dates and times will vary, check here for details. RSVP required in advance via contact page here. Visitors welcome! Local naturalist walks are held on Saturday morning (9.00am-12.00pm, as advertised), see dates /times below (please arrive 5 minutes before advertised start time for registration). Meet at the G﻿olden Square ﻿ H﻿all (9 Old Hi﻿gh Street). Visitors Welcome. Local naturalist walks include natural history, forest ecology, observation (birds, plants, fungi, and insects), recording sightings/using digital technology, and learning/developing a range of field skills. Please carry your own water (and light snack if required). Wear clothing suitable for the prevailing conditions (hat, full length cover –shirt/pants, enclosed footwear (eg running/sports shoes), waterproof Jacket). Walks will be short and of easy or occasionally moderate difficulty, suitable for anyone with a basic level of general fitness. Please email us here for further enquirers. If you are keen to visit a specific location listed, please ensure you confirm details prior to the excursion, walk details can change without notice at the discretion of the organiser due to various circumstances. 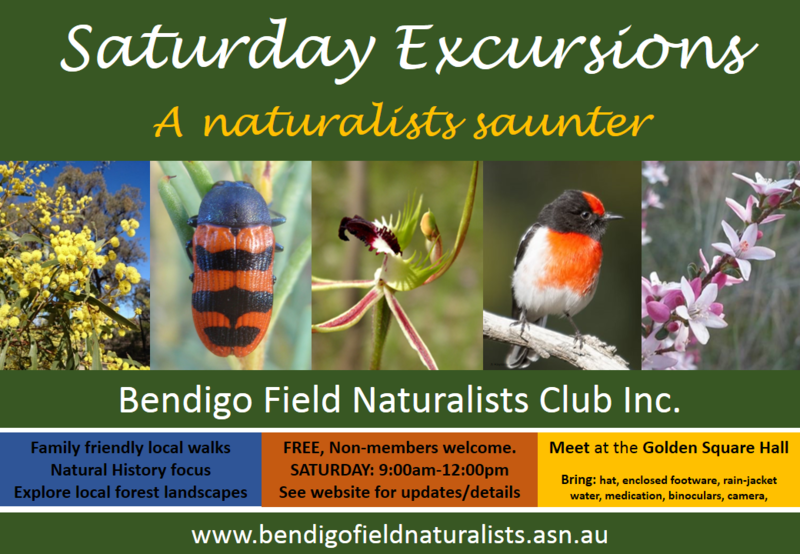 The Bendigo Field Naturalists Club manages the Golden Square Hall. The Golden Square Hall is a public facility that can be hired for single or regular events. It features a main hall, kitchen, meeting room and office. There is convenient public transport access or ample street parking. Visit the Golden Square Hall website to find out more information or make an enquire about booking the facility.